When the doors to the Tampa RV SuperShow open on Wednesday, longtime Prevost conversion leader Liberty Coach will be joined by Emerald Luxury Coaches of Stephenville, Texas at Booth 100 of the Florida State Fairgrounds in Tampa. 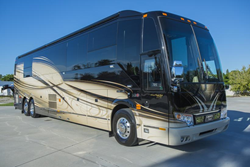 Located just inside the Gate 1 entrance off U.S. 301, the two companies’ shared space is sure to draw plenty of traffic to the Prevost conversion display area with two distinctively different approaches to the art of motorcoach design. On one hand there’s Emerald, a relative newcomer to the Prevost field from John Walker, whose Outlaw Conversions is a world leader in horse trailer conversions. Emerald’s coaches offer distinctively warm, homelike interiors, quality materials and impeccable craftsmanship, all for prices well below the industry average. Then there’s Liberty, the perennial Prevost sales leader – for 2014, they chalked up an astounding 109 coach sales – and universally regarded as the “Rolls Royce of the industry.” Year in and year out, SuperShow crowds flock to the Liberty booth to catch up on the latest and greatest in coach innovations. And this year, once again, they won’t be disappointed. Among the many new features Liberty is showcasing is a 65-inch UHD television in the lower bay entertainment center – by far the largest set ever installed in a lower bay configuration. The new TV is standard equipment in both of the 2015 coaches Liberty will have on display at the show, which include the Verona Bedroom Superslide Edition (Stock No. 780) and the double slide Fairfax Edition (Stock No. 785). Also available for viewing will be Emerald Coach No. 5395, the very latest model from Emerald Luxury Coaches. The shared SuperShow display is the latest development in the mutually beneficial relationship between the two companies, which began last spring when Liberty announced an agreement to provide sales and dealership services for Emerald Luxury Coaches. And for SuperShow attendees, it’s a great opportunity to see the very best of what’s new in Prevost coach conversions from two of the most dynamic manufacturers – both in the same booth. With locations in Stuart, FL and North Chicago, IL, Liberty Coach has been providing legendary leadership in the luxury motor coach industry for over 40 years. For more information about Liberty’s custom Prevost motor coaches, please visit http://www.libertycoach.com or call 800-554-9877. Or stop by Booth 100 at the Tampa RV Supershow, January 14-18, at the Florida State Fairgrounds in Tampa.